anything that has mass and occupies space. Matter is sometimes called koinomatter (Gr. koinos=common) to distinguish it from antimatter, or matter composed of antiparticles. forces that are exerted by molecules on each other and that, in general, affect the macroscopic properties of the material of which the molecules are a part. Such forces may be either attractive or repulsive in nature. , change of a solid substance directly to a vapor without first passing through the liquid state. The term is also used to describe the reverse process of the gas changing directly to the solid again upon cooling. resistance of a fluid to flow. This resistance acts against the motion of any solid object through the fluid and also against motion of the fluid itself past stationary obstacles. ..... Click the link for more information. ). Properties in which solids differ from one another include density, hardness, malleability, ductility, elasticity, brittleness, and tensile strength. one of the four states of aggregation of matter, the others being liquid, gas, and plasma. Substances in the solid state, or solids, are distinguished by stability of shape and by the nature of the thermal motion of their atoms, which perform small oscillations about equilibrium positions. In addition to the crystalline state of solids (seeCRYSTALS), there exists the amorphous state, which includes the vitreous, or glassy, state. Crystals are characterized by long-range order in the arrangement of atoms. In amorphous solids, long-range order is absent (seeLONG-RANGE AND SHORT-RANGE ORDER). The laws of classical physics are applicable to most solids. According to these laws, the lowest energy state of a system of atomic particles (atoms, ions, or molecules) is associated with a periodic arrangement of identical groups of particles—that is, with a crystalline structure. From the thermodynamic point of view, therefore, the amorphous state is not an equilibrium state and should, over a period of time, crystallize. Under ordinary conditions, however, this time may be so great that the amorphous solid does not exhibit its nonequilibrium nature and is practically stable. The difference between a crystalline solid and a liquid is qualitative: the crystal has, and the liquid lacks, long-range order in the arrangement of atoms. The difference between an amorphous solid and a liquid is only quantitative: an amorphous solid can be regarded as a liquid with a very high viscosity, which may often be assumed to be infinitely large. The concept of a solid, like that of a liquid, is an idealization. It would be more accurate to speak of the solid and liquid properties of a condensed medium. From the standpoint of elastic properties, for example, a substance with a nonzero static shear modulus θ should be considered a solid; for a liquid, θ = 0. With respect to plastic properties, a substance that is irreversibly de-formable only under a finite applied stress above a certain threshold value should be considered a solid; for liquids, even highly viscous, resin-type liquids, the threshold stress of irreversible deformation is zero. All substances in nature solidify at atmospheric pressure and a temperature T > 0°K, with the exception of He, which at atmospheric pressure remains liquid down to T = 0°K. A pressure of 24 atmospheres (atm), at T = 1.5°K, is necessary for the crystallization of He. This unique property of He is explained in the quantum theory of solids and liquids (seeHELIUM and QUANTUM FLUID). A special state of matter that is intermediate between a crystal and a quantum fluid has been detected in the investigation of solid solutions of helium isotopes under pressure. This state is called a quantum crystal. In ordinary crystals, the wave properties of the atoms lead to the existence of lattice vibrations at T = 0°K. In quantum fluids, these properties completely destroy the crystal structure. In quantum crystals, the wave properties of the atoms preserve the distinctness of the lattice sites but allow the atoms to move from site to site. Solids are the principal materials used by man. Various properties of solids have been made use of in all the devices created by man, from the flint implements of Neanderthal man to modern machines and mechanisms. In the early stages of the development of civilization, such directly perceptible mechanical properties of solids as hardness, weight, plasticity, elasticity, and brittle-ness were made use of, and solids were employed only as structural materials. Modern technology makes use of a tremendous range of physical properties of solids—such as electrical, magnetic, and thermal properties—that are generally inaccessible to direct human perception and can be detected only in laboratory investigations. All properties of a solid can be understood on the basis of a knowledge of its atomic and molecular structure and the laws governing the motion of atomic particles (atoms, ions, and molecules) and subatomic particles (electrons and atomic nuclei). The properties of solids and the motions of particles in solids are the subject of the important branch of modern physics known as solid-state physics, whose development has been stimulated by practical needs, principally in technology. Solid-state physics uses concepts and methods of investigation that are specific to it and employs a well-defined and often sophisticated mathematical apparatus. Although remaining a part of physics, solid-state physics has become a distinct scientific discipline. This fact is manifested, for example, in the existence of a large number of specialized scientific institutes and journals. One such institute is the Institute of Solid-state Physics of the Academy of Sciences of the USSR. Examples of journals are Fizika tverdogo tela, Fizika metallov i metallovedenie, and Fizika i tekhnika poluprovodnikov, which are published in English as Soviet Physics—Solid State, Physics of Metals and Metallography, and Soviet Physics—Semiconductors, respectively. Approximately half of the physicists in the world work in the field of solid-state physics, and nearly half of all scientific publications in physics pertain to research on solids. Quantum concepts. The properties of solids can be explained only on the basis of quantum mechanics. The quantum theory of crystals has been worked out in extremely great detail; less progress has been made in the quantum theory of amorphous solids. An important result of the quantum approach to the investigation of the properties of crystalline solids has been the notion of quasi-particles. The energy of a crystal near the ground state may be represented as the sum of elementary excitations—that is, as the sum of the energies of individual quasiparticles. It is thus possible to introduce the concept of a gas of quasiparticles and to use methods of the quantum physics of gases to investigate the thermal, magnetic, and other properties of solids. Here, the macroscopic characteristics of solids are expressed in terms of such characteristics of the quasiparticles as mean free path, velocity, and effective mass. Elementary motions are much more complex in amorphous solids than in crystals. For this reason, graphic concepts analogous to the concept of quasiparticles cannot be introduced to describe the excited states of amorphous solids. The density structure of these states, however, has been ascertained. A discussion follows of several characteristic features of solids that can be identified when solids are viewed as physical objects consisting of a large (macroscopic) number of atomic particles and electrons. (1) Atoms, molecules, and ions are the structural units of solids. In other words, the energy of interaction between these units is small compared with the energy that must be expended to break up a structural unit—to break up a molecule into atoms, an atom into an ion and electrons, and an atomic nucleus into nucleons. The interaction energy, however, is great compared with the energy of the thermal motion of the structural units; in gases, by contrast, the opposite is true. When the energy of thermal motion is of the order of or is greater than the energy of interaction between structural units, a rearrangement of the solid’s structure occurs that leads to a reduction of the free energy of the system. Such a rearrangement of structure is called a phase transition. (2) According to classical laws, the average energy of thermal motion of a particle is approximately kT and the excitation energy of a solid is approximately NkT. Here, k is the Boltzmann constant, and N is the number of particles making up the solid. When the temperature of a solid decreases, its energy decreases more rapidly than is called for by classical physics: the discrete, or quantum, character of the energy spectrum of the solid leads to a “freezing out” of motions as T → 0°K. The greater the separation between energy levels, the higher the temperature at which the corresponding motion freezes out. Different motions in solids therefore are significant at different temperatures. (3) In crystalline solids, static excited states are possible: the particles are not quite arrayed as they should be according to considerations of minimum energy. The incorrect positioning of an atom or the absence of an atom (seeDEFECTS, CRYSTAL) leads to a large increase in the interaction energy of the atoms near the defect. In a stable state, however, there are comparatively few incorrectly positioned atoms. An amorphous solid, whose energy is greater than that of the corresponding crystal, is generally metastable because of the high potential barriers (a consequence of short-range order) that separate the metastable positions of the atoms from the stable positions. (4) Because of the variety of forces acting between the particles constituting a solid, the properties of gases, liquids, and plasmas may be exhibited in crystals under certain conditions. For example, at T = 0°K a ferromagnetic is an ordered system of oriented atomic magnetic moments. As the temperature increases, this strict orientation is disturbed by thermal motion; at T = TC (the Curie point), the orientation completely vanishes, and the solid undergoes a transition to the paramagnetic state. The relation between TC and the energy of interaction Um between neighboring magnetic moments is given by the approximate equality kTC ≈ Um. When T ≫ TC, the atomic magnetic moments behave like a gas of magnetic dipoles, and the magnetic susceptibility of the solid paramagnet has the same temperature dependence as that of a gaseous paramagnet. Another example is the circumstance that a metal can be regarded as an ionic framework immersed in an electron fluid. Because of the stable position of the ions, a metal is a solid, but some of its electrons are not associated with definite lattice sites. Such electrons are known as conduction electrons. As a result of the interaction of the conduction electrons in a metal with each other, the properties of the aggregate of the conduction electrons are close to the properties of a quantum fluid. In some cases—for example, under the action of an electromagnetic field whose frequency exceeds the collision frequency of the electrons—the electron fluid in conductors behaves like a plasma (seePLASMA, SOLID-STATE). (5) The motions of the atomic particles in solids are extremely diverse and are manifested in various properties of the solids. All motions may be divided into three types. The first type is the diffusion of host or foreign atoms. The elementary diffusion event is the fluctuation displacement of an atom from the position it occupies to an adjacent, free position. The “settled” lifetime of an atom is generally much longer than the displacement time: the atom undergoes infrequent random jumps whose probability increases with temperature. Diffusional displacement is a comparatively rare example of classical motion of atoms in a solid. Collective motions constitute the second type of motions of particles. The simplest example of this type is lattice vibrations. The energy of the vibrating atoms is approximately equal to the sum of the energies of the individual vibrations. At high temperatures, the average energy of each vibration is ~kT. At low temperatures the average energy is determined by Planck’s formula and is <kT. Although all atoms of a solid take part in the lattice vibrations, the lattice vibrations are of atomic scale. (It may be recalled that the average energy of the translational motion of a particle in a classical gas is 3kT/2.) Another example is the electronic excitation of an atom. This excitation is not localized at a particular lattice site but moves from site to site. The energy of such motion, which can be excited by the absorption of a quantum of light or by an increase in temperature, is of the order of the excitation energy of an individual atom. Collective atomic-scale motions have a discrete structure. For example, the energy of vibration of the atoms at the frequency to may be equal to ħω 2ħω, 3ħω), and so forth. As a result, with every motion there can be associated a quasiparticle. The quasiparticles that describe the vibrations of the atoms are called phonons. The third type of motion occurs at very low temperatures. Near T = 0°K, the atomic particles in some solids (and in liquid He) may perform a motion that is quantum in nature but macroscopic in scale. The motion of electrons in superconductors and of atoms in superfluid helium has been studied most thoroughly. A characteristic feature of superconductive and superfluid motion is a strict coordination in the behavior of the particles arising from the interaction between them. In order not to exhibit such behavior, a particle must surmount an energy gap. The existence of an energy gap accounts for the stability, or sustained character, of superconductive and superfluid motion (see SUPERCONDUCTIVITY and SUPERFLUIDITY). (6) Knowledge of the atomic structure of a solid and of the nature of the particle motion in the solid (its energy spectrum) makes it possible to determine what quasiparticles are responsible for a given phenomenon or property. For example, the high electrical conductivity of metals is due to conduction electrons, and the high thermal conductivity is due to conduction electrons and phonons. Some characteristics of the absorption of light in dielectrics are due to excitons. Ferromagnetic resonance is due to magnons. The difference in the quantitative characteristics of the different motions makes it possible to distinguish one motion from another. For example, because of the large difference in masses, the rate of motion of the ions in metals and semiconductors is very low compared with that of the electrons. In what is called the adiabatic approximation, therefore, the ions can be regarded as stationary when the motion of the electrons is considered, and the motion of the ions can be determined from the characteristics of the electrons averaged over the electrons’ rapid motion. The independence of different types of motion in a solid is often due to the low energy of interaction between degrees of freedom of different kinds. In a ferromagnet, for example, spin waves and the vibrations of atoms have an energy and velocity of approximately the same scale, but the coupling between the spin waves and vibrations is small, because the magnetostrictive forces are small (seeMAGNETOSTRICTION). In some cases, however, a resonance interaction occurs between wave processes of different types when their frequencies and wavelengths coincide. As a result, the motions become “entangled” with each other. For example, the vibration of atoms (sound) can be excited by an alternating magnetic field, and a sound wave can be spontaneously converted into a spin wave. (7) With a sufficient increase in temperature, all solids melt or sublimate. The heat supplied to a solid in the melting process is used up in breaking interatomic bonds. The melting point Tmelt, which characterizes the cohesive force holding together the atomic particles in a solid, is different for different solids. For molecular hydrogen, Tmelt is –259.1°C; for tungsten, it is 3410° ± 20°C; and for graphite, it is greater than 4000°C. An exception is solid 3He, which melts under pressure with decreasing temperature (seePOMERANCHUK EFFECT). As external conditions such as pressure, temperature, and magnetic field change, discontinuous changes of structure and properties occur in solids. These changes represent first- and second-order phase transitions. The property of a solid having different stable crystal structures, or modifications, is called polymorphism. Graphite and diamond, for example, are modifications of the same substance, as are white and gray tin. The transition from one modification to another is sometimes a first-order transition and sometimes a second-order transition. Examples of second-order transitions are the transition of substances from the paramagnetic state to a ferromagnetic or antiferromagnetic state, the transition from the normal state to the superconductive state in the absence of a magnetic field, the ordering of a number of alloys, and the appearance of ferroelectric properties in some dielectrics. (8) In most cases, at a given temperature the degrees of freedom of the atomic particles in a solid can be divided into two categories. For some degrees of freedom, kT is large compared with their characteristic interaction energy Uinter; for the other degrees of freedom, kT is small compared with Uintet. Degrees of freedom for which kT ≫ Uinter can be described in terms of a particle gas; for example, when T ≫ TC, the concept of a gas of magnetic dipoles can be used. 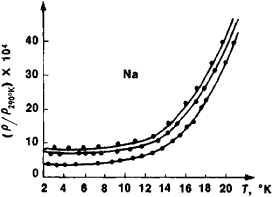 Degrees of freedom for which kT ≪ Uinter are at a low level of excitation. For this reason, the motions corresponding to them can be described by introducing quasiparticles that interact weakly with each other. Thus, in most cases the properties of solids can be reduced to the properties of gases of either particles or quasiparticles. Here, the strong interaction does not cease to play a role but determines the structure of the solid—for example, the structure of its crystal lattice—and the properties of an individual quasiparticle. In contrast to particles in real gases, quasiparticles exist not in free space but in the crystal lattice, whose structure is reflected in the properties of the quasiparticles. Near points of second-order transitions, such a reduction is impossible, since under these conditions the motion of the atomic particles in solids is correlated. In the language of quasiparticles, this fact means that their interaction cannot be ignored. The correlation is of a special, nonforce character: the probability of collective motions of particles and quasiparticles is just as great as that of their individual motions. An increase in the role of correlation in particle motion leads to such observed effects as an increase in specific heat and magnetic susceptibility. Near a second-order transition, a solid behaves like a system of strongly interacting particles or quasiparticles, which is fundamentally irreducible to a gas. Near a second-order transition, a solid can serve as a model of much more complex systems, for example, nuclear matter or elementary particles in the process of their interaction. Knowledge of the atomic and molecular structure of solids and of the nature of the motion of the constituent particles makes it possible to explain observed phenomena, to predict as yet undiscovered properties of solids, to alter the structure of solids in a purposeful way, and to synthesize solids with unique properties. A number of separate areas of investigation have developed in solid-state physics. Some of these areas are identified by their subject of study, for example, metal physics, semiconductor physics, and the physics of magnetic substances. Some areas are concerned with a particular method of investigation, such as X-ray diffraction analysis or radio-frequency spectroscopy. Finally, some areas deal with certain properties of solids, such as mechanical or thermal properties. Such a division of solid-state physics into separate areas has been possible because of the relative independence of atomic motions in solids. Crystalline structure. The crystalline structure of a solid depends on the forces acting between atomic particles. By varying the mean distance between atoms by means of external pressure, the contributions of interatomic forces of differing natures can be substantially altered, and, consequently, the crystal structure of the solid can be changed. A large number of different crystalline modifications that exist at high pressures have been detected. Many of these modifications differ in their physical properties. For example, Bi under pressure forms three superconducting modifications: at 25,300 atm < p < 27,000 atm, Bi II, for which the transition temperature is Tc = 3.93°K; at 27,000 atm < p < 80,000 atm, Bi III, for which Tc = 6.9°K; and at 80,000 atm < p, Bi IV, for which Tc = 7°K. Under pressure, many semiconductors undergo a transition to the metallic state; for example, Ge becomes a metal at p ≈ 120,000 atm. The metal Yb is converted under pressure into a semiconductor. There are grounds for believing that molecular hydrogen can be converted into a metal at a pressure of 2–3 × 106 atm. At extremely high pressures or densities, the volume per atom becomes less than the normal size of the atom. Under such conditions, atoms lose their individuality, and matter is converted into a highly compressed electron-nuclear plasma. The investigation of this state of matter is important, in particular, for understanding the structure of stars. The atomic structure of crystals is determined experimentally by X-ray diffraction analysis, and the magnetic structure of ferromagnetic and antiferromagnetic substances—that is, the orientation of the magnetic moments of atoms—is determined by neutron diffraction analysis. A complete knowledge of the atomic structure requires knowing the dimensions of the unit cell of the crystal and the positions of the atoms within the unit cell. In many cases, however, it is sufficient to know only the symmetry elements of the given crystal. In a macroscopic description of solids—that is, of their mechanical, electrical, thermal, and optical properties—a crystal may be regarded as a continuous anisotropic medium in which the symmetric arrangement of the atoms leads to the equivalence of directions. The basis of the symmetry of an infinite crystal lattice is the lattice’s spatial periodicity—that is, its ability to be superposed on itself under translations over certain distances in certain directions. The equivalent lattice sites that can be superposed on each other by means of translation form the Bravais lattice. There are 14 types of Bravais lattices. With respect to symmetry, Bravais lattices are classified into seven crystal systems. Moreover, a crystal lattice may have axes of symmetry, planes of symmetry, rotation-reflection axes, screw axes, and glide mirror planes. The sets of symmetry axes and planes that determine the symmetry of the physical properties of crystals are called crystal, or symmetry, classes; there are 32 possible crystal classes. The aggregate of all the symmetry elements of a crystal lattice is called its space group; 230 different space groups are possible. If the magnetic properties of the atoms constituting the crystal lattice are taken into account, then 1,651 magnetic space groups are possible (seeSYMMETRY OF CRYSTALS). STRUCTURE OF A REAL CRYSTAL. Although single crystals of large size are seldom encountered in nature, artificially grown single crystals are increasingly being used in technology (seeSYNTHETIC CRYSTAL). Structural materials used in practice are generally polycrystals consisting of a large number of small single crystals, called grains. Many properties of solids, such as plasticity and strength, depend on grain size. When the grains are randomly oriented, the polycrystal may be considered an isotropic solid, although each crystal, taken separately, is anisotropic. Some polycrystals exhibit an anisotropy associated with the conditions of their crystallization and processing, which may involve, for example, oriented growth, rolling, or forging. This anisotropy is called texture. Grain boundaries violate the strict periodicity of the arrangement of the atoms in a crystal. Other types of defects found in crystals include microscopic inclusions (for example, nuclei of another crystalline modification and cavities), the surface of the specimen itself, foreign impurity atoms, vacancies, interstitial atoms, and dislocations. In many cases, the presence or absence of particular defects determines the structure-sensitive properties of a solid—for example, electrical conductivity, optical properties, and mechanical properties, such as plasticity and strength. INTERATOMIC BONDS. According to the type of bonding, crystalline solids are classified into five groups: ionic, covalent, metallic, molecular, and hydrogen-bonded (Table 1). Each group is characterized by a distinctive spatial distribution of electrons. In ionic crystals, such as NaCl and KCl, the principal forces acting between the ions are the forces of electrostatic attraction. The distribution of the electronic charge near each ion is almost spherical and is slightly distorted in the region of contact with neighboring ions. In covalent, or valence, crystals, the valence electrons are shared between neighboring atoms. The crystal is essentially a vast molecule. This type is characterized by a high electron density between the ions and by a pronounced directionality of the bonds. Examples of crystals with covalent bonding are diamond, Ge, and Si. 1For crystals of the first two types, the cohesive energy is determined at 300°K; for molecular crystals and hydrogen-bonded crystals, the cohesive energy is determined at the melting point. The cohesive energy is sometimes measured in terms of the energy per particle needed in order to break up the crystal into independent atoms or ions by heating the crystal from 0°K. In most metals, such as alkali metals, the cohesive energy is due to conduction electrons. In order to understand the nature of a metallic bond, the metal may be regarded as a lattice of positive ions immersed in a sea of electrons. In some metals, such as the transition metals, covalent bonding involving electrons of unfilled inner shells is also important. In molecular crystals, for example, in solidified inert gases, the molecules are held together by weak electrostatic forces, called Van der Waals forces, which are due to mutual polarization of the molecules. Weak bonding is characteristic of all molecular crystals, and they have low melting points and a strong tendency to sublimate. Most organic crystals are bonded by Van der Waals forces (seeMOLECULAR INTERACTION). In crystals with hydrogen bonding, every hydrogen atom is bonded by attractive forces to two other atoms. The hydrogen bond is the main form of interaction between water molecules. The hydrogen bond, together with the electrostatic attraction of the dipole moments of H2O molecules, determines the properties of water and ice. It should be noted that the classification of solids according to type of bonding is arbitrary. In many substances, combinations of different types of bonding are observed. The nature of the binding forces in solids did not receive an explanation until quantum mechanics was brought to bear on the problem. Electrostatic attraction and repulsion, however, are the source of the forces acting between atomic particles in solids. The formation of stable solids from atoms and molecules shows that the attractive forces are balanced at distances of ~10–8 cm by repulsive forces that decrease rapidly with distance. In many cases, atomic particles can thus be regarded as solid spheres and can be characterized by their crystal chemistry radii (seeCRYSTAL CHEMISTRY). to each other and to the quantities found in the expression for the force acting between particles. Theoretical methods permit the calculation, on the basis of first principles, of the crystal structure, equation of state, and thermal properties of solids over a broad range of temperatures. For ionic and molecular crystals, the theoretical results agree well with the experimental data. For covalent crystals and metals, allowance must be made for the unpaired nature of the forces acting between particles. Mechanical properties. The mechanical properties of a solid—that is, the response of the solid to external mechanical forces, such as compression, stretching, bending, and impact—are determined by the cohesive forces between the structural particles of the solid. The diversity of these forces is responsible for differences in mechanical properties; for example, some solids are plastic, and others are brittle. Metals in which the cohesive forces are determined by the collective action of conduction electrons are usually more plastic than dielectrics. At room temperature, for example, the deformation of Cu at the time of fracture reaches a few tens of percent. NaCl, on the other hand, is brittle and breaks almost without deformation. Mechanical characteristics vary with temperature. For example, plasticity usually increases with temperature. The response of most solids to an external mechanical force depends on the rate at which the force is applied; a solid that is brittle under an impact load may withstand a much greater static load. Under small static loads, a linear relation between stress and strain is observed in all solids. This relation is known as Hooke’s law, and such strain is called elastic strain. Elastic strain is reversible—that is, it disappears when the stress is removed. An ideal single crystal, that is, a single crystal without defects, would be capable of reversible deformation until it fractures. The ultimate strength of such a crystal would correspond to the cohesive forces between the atoms. Under large loads, the response of a real solid depends to a considerable degree on the nature of the defects in the specimen (for example, on the presence or absence of dislocations and on the size of the grains); fracture begins at the weakest points. A dislocation is the most mobile type of crystal defect. For this reason, in most cases dislocations determine the plasticity of a crystal. The creation and movement of a dislocation are the elementary events of plasticity. The mechanical properties of a solid depend on the processing it undergoes, which may introduce or remove defects. Examples of such processes are annealing, hardening, alloying, and hydroextrusion. Thus, the tensile strength of a specially treated steel is 300–500 kilograms-force per mm2 (kgf/mm2), and that of ordinary steel of the same chemical composition is no more than 40–50 kgf/mm2 (Table 2). The elastic properties of isotropic solids—in particular, the elastic properties of polycrystals—are described by Young’s modulus E (the ratio of tensile stress to linear strain) and by Poisson’s ratio v (the ratio of lateral contractional strain to linear extensional strain). These two quantities characterize the response of a specimen in the form of a homogeneous rod to tension or compression. For steel and malleable iron, E = 2.1 × 106kgf/cm2. It follows from the condition of stability of the unstrained state that E > 0 and –1 < v < 1/2. Solids with a negative Poisson’s ratio, however, have not been observed in nature. Young’s modulus and Poisson’s ratio determine the propagation velocity of sound waves in an isotropic solid. The elastic properties of an anisotropic crystal are described by a fourth-rank tensor, the number of whose independent components depends on the crystal symmetry. The absorption of sound, and of elastic waves in general, in a solid is due to the following: the nonuniformity of the temperature in different sections of the solid as the wave passes through it, the resulting appearance of irreversible heat flows (thermal conduction), and the finite rates of motion of the particles in a solid. The irreversible scattering processes associated with the finite nature of the rate of motion are called internal friction, or viscosity. In ideal crystals, the thermal conductivity and viscosity are determined by collisions of quasi-particles with each other; in real crystals, the scattering of sound waves by lattice defects is added to these processes. Diffusion also plays an important role. The investigation of sound absorption is one method of studying the dynamic properties of solids, particularly the properties of quasiparticles. The mechanical properties of solids are the basis for the use of solids as structural materials in engineering. In particular, knowledge of the relation between strains and stresses makes it possible to solve specific practical problems of the distribution of stresses and strains in solids of different shape—such as beams, plates, and shells—under diverse loads, for example, under bending and twisting (seeSTRENGTH OF MATERIALS). Particle motion.PHONONS. The investigation of the thermal motion of particles in condensed media leads to the concept of phonons. If N is the number of cells in a crystal and v is the number of atoms or ions in the unit cell, then 3Nv is the total number of degrees of freedom of the atoms in the crystal that perform vibrational motion about equilibrium positions. The vibrational character of the atoms’ motion is preserved up to the melting point Tmdt. When T = Tmelt, the average amplitude of the vibration of an atom is less than the interatomic distance. Melting is due to the circumstance that the thermodynamic potential of the liquid at T > Tmelt is less than the thermodynamic potential of the solid. In the first (harmonic) approximation, the system with 3Nv vibrational degrees of freedom can be regarded as a set of 3Nv independent oscillators, each of which corresponds to a separate normal mode of vibration. In a crystal with violations of periodicity, that is, with defects, the normal modes include special modes in which not all the atoms of the crystal participate, but only those localized near a defect, such as a foreign atom. Vibrations of this type are said to be localized. Although they are not great in number, in many cases they determine some physical properties, such as optical properties and the characteristic features of the Mössbauer effect. Localized surface waves whose amplitude decreases exponentially with distance from the surface (Rayleigh waves) may propagate in a solid near its surface. Similar waves can propagate inside a crystal along planar defects, such as grain boundaries, and along dislocations. A normal vibration is a wave of displacements of the atoms from their equilibrium positions. There are 3v types (modes) of normal vibrations; for simple, or monatomic, lattices, v = 1. Each wave is characterized by a wave vector k and a frequency ω. To different normal modes there correspond different relations ωs(k), where s = 1, 2,..., 3v. These relations are called dispersion relations. Because of the periodicity of the arrangement of the atoms, all quantities dependent on k in a crystal are periodic functions. For example, ωs (k + 2πb) = ωs(k), where b is an arbitrary vector of the reciprocal lattice. If the forces of interaction between the structural particles of a crystal are known, the dispersion relations can be calculated. There also exist experimental methods for determining the relations. The most effective such method makes use of the inelastic scattering of slow neutrons in crystals. Here, cs is the speed of sound in the crystal and depends on the direction of propagation of the sound. These three normal modes are called acoustic modes; when they are excited, the atoms of a cell vibrate as a single whole. The remaining 3v – 3 modes are called optical modes (they were first detected from the resonance absorption of light). The frequency ω of an optical mode approaches a finite limit as k → 0. Here, the atoms of the unit cell vibrate with respect to each other, and the cell’s center of gravity is at rest. Each mode has a maximum frequency . Consequently, there exists a maximum frequency for the vibrations of atoms in a crystal: ωmax ≈ c/a ≈ 1012–1013 sec–1. Knowledge of the dispersion relation permits the density of states v(ω) to be determined. The number of vibrational states in the frequency range (ω, ω + Δω) is v(ω)Δω. When ω → 0, v(ω) ~ ω2; when ω → ωmax, . The density of states plays a crucial role in the thermodynamic equilibrium properties of solids. where n̄ps is the average number of phonons of species s(s = 1,2, ..., 3v) with quasimomentum p. The Planck function can be regarded as the distribution function of an ideal gas of phonons that obey-Bose-Einstein statistics (seeSTATISTICAL MECHANICS). Since the chemical potential of phonons is zero, the number of phonons present depends on the temperature. At high temperatures, the number of phonons increases linearly with temperature. At low temperatures, the number increases as T3; this fact reflects the decrease in the amplitude of the thermal vibrations of atoms with decreasing temperature. In actuality, a phonon gas is not ideal, since phonons interact with each other. Accordingly, we may speak of the anharmonicity of the vibrations. The higher the temperature, the more important this interaction. The interaction of phonons is described theoretically by introducing for them a mean free path, which increases with decreasing temperature. Phonons interact not only with each other but also with other quasiparticles and with all defects in the crystal; in particular, phonons are scattered by the boundaries of the solid. In amorphous solids, the thermal motion of the particles is also vibrational in character. Phonons, however, can be introduced only for the low-frequency acoustic vibrations where many atoms vibrating in phase lie within a wavelength and the atoms’ relative positions are not of great importance. Since the maximum frequencies of atomic vibrations are determined by the forces of interaction between neighboring atoms, the maximum frequencies in amorphous solids differ little from those in crystals. For this reason, and also because of the presence of short-range order, the density of vibrational states in amorphous solids is close to the density of vibrational states in crystals. Here, W0 ~ Wmax ≈ 1012–1013 sec–1, and the quantity v is of the order of the cohesive energy per particle. Therefore, all processes in a solid that are accompanied by the transport of matter, such as diffusion and self-diffusion, proceed comparatively slowly. The rate of the processes increases only near the melting point. The diffusion coefficient, which determines the flow of particles along a known concentration gradient, is proportional to W and essentially depends on the state of the crystal lattice. Plastic deformation usually loosens up the crystal, lowers the potential barriers separating the equilibrium positions of the atoms, and, consequently, increases the probability that atoms will jump from one site to another. The tunneling of atoms from one equilibrium position to another is possible in exceptional cases—for example, in solid He. Because of this “quantum” diffusion, the diffusion coefficient does not go to zero as T → 0°K. The delocalization of atoms associated with tunneling converts impurity atoms and vacancies into the distinctive quasiparticles known as impuritons and vacancyons, respectively. These quasiparticles determine the properties of quantum crystals. Thermal properties. In most solids, the specific heat C at room temperatures approximately obeys the Dulong and Petit law: C = 3R calories per mole, where R is the gas constant. The Dulong and Petit law is a consequence of the circumstance that atomic vibrational motions that obey the equipartition law (the average energy per vibrational degree of freedom equals kT) are responsible for the thermal properties of solids at high temperatures. The deviations observed at high temperatures from the Dulong and Petit law are due to the increasing importance of the role of the anharmonicity of the vibrations. A decrease in temperature leads to a decrease in specific heat; because of quantum freezing out, the average vibrational energy ℰk, as defined by the expression ℰk = ħω[exp (ħω/kT) – 1], is less than kT. At very low temperatures, the part of specific heat due to lattice vibrations is C ~ T3. The vibrational part of the specific heat of a solid may be thought of as the specific heat of the phonon gas. The transition from the classical value of specific heat C = 3R to the quantum value C ~ T3 is observed at a temperature θ characteristic of each solid. The physical meaning of this temperature, which is called the Debye temperature, is defined by the relation Kθ = ħωmax. Consequently, when T < θ, there are vibrations in the solid to which quantum laws must be applied. For most solids, θ is between 102° and 103°K. In molecular crystals, θ is anomalously low, being approximately 10°K. The temperature dependence of the vibrational part of the specific heat for T ≪ θ, like its value for T ≫ θ is the same for all solids (Figure 1), including amorphous solids. In the intermediate temperature range, the specific heat depends on the properties of v(ω), that is, on the actual spectral frequency distribution of the solid. Near T = 0°K, other (nonvibrational) low-lying energy levels of a solid play a considerable role because of the decrease in the vibrational part of the specific heat of the solid. For example, in metals at T ≪ θ(kθ/ℰF)1/2, where ℰF is the Fermi level, conduction electrons make the principal contribution to specific heat; the electronic specific heat is ~T. In ferrites at T ≪ θ2/TC, where TC is the Curie point, spin waves make the principal contribution; the magnon part of the specific heat is ~ T3/2. The quantum freezing out of most motions in a solid as T → 0°K makes it possible to measure the nuclear specific heat and the specific heat due to localized vibrations of particles. where V is the volume of the solid and p is the pressure. According to Grüneisen’s law, the ratio α/C is independent of temperature. Although Griineisen’s law holds only approximately, it reproduces the temperature dependence of α in a qualitatively correct way. Thermal expansion is a consequence of vibrational anharmonicity: for harmonic vibrations, the mean distance between particles is independent of temperature. The conduction of heat depends on the type of solid involved. 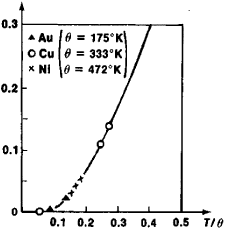 Because of the participation of conduction electrons in heat transfer, metals have a much higher thermal conductivity than do dielectrics. Thermal conductivity is a structure-sensitive property. The thermal conductivity depends on the crystalline state (a single crystal or polycrystal), the presence or absence of defects, and other factors. The phenomenon of thermal conduction can be conveniently described by using the concept of quasiparticles. All quasiparticles, particularly phonons, transport heat. According to the kinetic theory of gases, the contribution of each quasiparticle gas to the thermal conductivity can be written in the form γCv̄l, where γ is a numerical factor, C is the specific heat, v̄ is the average thermal velocity, and l is the mean free path of the quasi-particle. The quantity l is determined by the scattering of quasiparticles, which in the case of phonon-phonon collisions is a consequence of the anharmonicity of the vibrations. Because of the variety of motions occurring in a solid that affect the solid’s thermal properties, the temperature dependence of most quantities characterizing solids is very complex. It is further complicated by phase transitions, which are accompanied by a sharp change in many quantities, such as specific heat, when the transition point is approached. Electrons; band theory. Because the interatomic distances in a solid are of the order of the dimensions of the atoms, the outer, or valence, electrons may lose their contact with a specific atom and move throughout the entire solid. As a result, the discrete atomic energy levels broaden into bands. Bands of permitted energies may be separated from each other by bands of forbidden energies or may overlap. Deep-lying atomic levels broaden only slightly, but the levels corresponding to the outer shells of the atom broaden to such an extent that the corresponding energy bands usually overlap. The individuality of the bands is preserved, however: the states of electrons having the same energy but belonging to different bands are different. In crystals, because of the periodicity of the forces acting on an electron in a band, the state of the electron is determined by the quasimomentum p, and the energy ℰ of the electron is a periodic function of the quasimomentum: ℰs(p + 2πħb) = ℰs(p), where ℰs(p) is the dispersion relation and s is the band number. In amorphous solids, even though the state of the electron is not determined by quasimomentum (quasimomentum cannot be introduced), the band character of the electron energy spectrum is preserved. There apparently are no strictly forbidden energy bands in amorphous solids, but quasi-forbidden regions exist in which the density of states is less than in the allowed bands. The motion of an electron with energy from a quasi-forbidden region is localized, whereas the motion of an electron with energy from an allowed band is delocalized, as in a crystal. In accordance with the Pauli exclusion principle, no more than two electrons can be located in each energy state. Each energy band of a crystal, therefore, cannot contain more than 2N electrons, where N, the number of levels in the band, is equal to the number of unit cells in the crystal. When T → 0°K, all the electrons occupy the lowest energy states. The existence of solids with different electrical properties is related to the way in which the energy bands are occupied by electrons at T = 0°K. If the bands are either completely filled or completely empty, the solid cannot carry an electric current—that is, the solid is a dielectric (Figure 2,a). 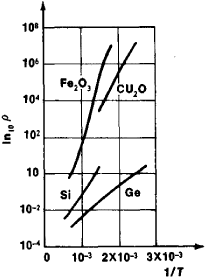 Solids that have partially filled bands are metals, which are good conductors (Figure 2,b). Semiconductors have no partially occupied bands at T = 0°K and thus can be classified as dielectrics. In semiconductors, however, the forbidden band, or energy gap, between the highest filled band and the first empty allowed band is comparatively narrow (Figure 2,c). The highest filled band is called the valence band, and the first empty band is called the conduction band. The presence of defects and impurities in a crystal leads to the appearance of additional, impurity energy levels in the forbidden band. In semiconductors, these levels are often located very close to the valence band (Figure 2,e) or the conduction band (2,d). Solids with an anomalously small overlap of the valence and conduction bands are called semimetals; an example is Bi, for which the overlap width is ~10–5 of the band width. There exist gapless semiconductors, in which the conduction band borders on the valence band; examples are the alloys Bi-Sb and Hg-Te for certain ratios of the components. The energy level separating the occupied states from the vacant states is called the Fermi level. If it lies in an allowed band, there corresponds to it a constant-energy surface, called the Fermi surface, that bounds the region of occupied electron states in quasimomentum space. In semiconductors, the Fermi level lies in the forbidden band and is somewhat formal in character. In gapless semiconductors, the Fermi level coincides with the boundary between the valence band and the conduction band. Figure 2. 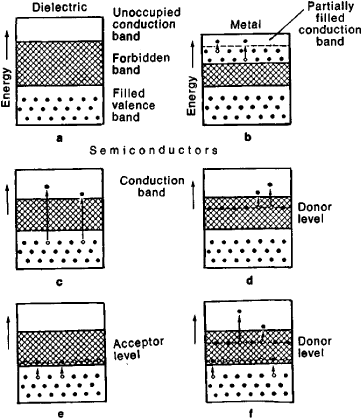 Allowed and forbidden bands of electron energy levels: (a) dielectric, (b) metal, (c) intrinsic semiconductor, (d) n-type semiconductor, (e) p-type semiconductor, (f) mixed semiconductor; the black dots represent electrons. Different conduction mechanisms predominate in the different types of semiconductors. positively charged particles, which are called holes. Depending on the location, the Fermi surface is for electrons or for holes. If the number of electrons ne (the number of occupied states close to the minimum energy in the band) is equal to the number of holes nh, the conductor is said to be compensated. An example is Bi, in which ne = nh ≈ 10–5 per atom. In gapless semiconductors, the Fermi surface degenerates into a point or line. The elementary excitation of the electronic system of a crystal consists in the acquisition of energy by an electron. As a result of this acquisition, the electron appears in a region of p-space where there was no electron in the ground state. At the same time, a vacancy, or hole, arises in the region of p-space occupied by electrons in the ground state. Since the electron and a hole move independently, they should be considered different quasiparticles. In other words, the elementary excitation of the electronic system consists in the production of a pair of quasiparticles: a conduction electron and a hole. The electrons and holes obey Fer-mi-Dirac statistics. In dielectrics and semiconductors, the excited states are separated from the ground state by an energy gap; in metals, semimetals, and gapless semiconductors, the excited states adjoin the ground state (Figure 2). The electronic system of a solid also gives rise to more complicated excitations: Mott-Wannier excitons, Frenkel excitons, and polarons in semiconductors and Cooper pairs in superconducting metals. Moreover, waves in the form of plasma vibrations may propagate through the electronic system of a solid; the corresponding quasiparticles are called plasmons. METALS. In metals at low temperatures, the electrons in partially filled bands, that is, the conduction electrons, play an important role in thermal properties. When T → 0°K, the specific heat and the coefficient of thermal expansion are linearly dependent on temperature because the electrons, which obey Fermi-Dirac statistics, are highly degenerate. The degeneracy remains at practically all temperatures, since for good metals the degeneracy temperature (Fermi temperature) TF = ℰF/k is ≳ 104°K. For this reason, the specific heat of metals at high temperatures is indistinguishable from the specific heat of dielectrics. Because of degeneracy, only electrons whose energy is ℰ ≈ ℰF, that is, electrons located near the Fermi surface, take part in many processes in metals. Fermi surfaces generally have a complex shape. The diversity of the shapes of Fermi surfaces in various metals is usually reflected in the behavior of the metals in a sufficiently strong magnetic field H, where the dimensions of the orbit of an electron (~ 1/H) are much smaller than the electron’s mean free path. The projection of the electron’s trajectory on a plane perpendicular to H is similar to a plane section of the Fermi surface. If, between two scattering events, the electron describes its trajectory many times, then the shape of the Fermi surface will be reflected in the properties of the electron. Oscillations of magnetic susceptibility (de Haas-Van Alphen effect) and electrical resistance (Shubnikov-de Haas effect) under a magnetic field make it possible to measure the areas of extremal cross sections of the Fermi surface. The extremal diameters of the Fermi surface can be measured from the absorption of ultrasound under a magnetic field. Galvanomagnetic effects permit the general contours of the Fermi surface to be determined. Cyclotron resonance permits determination of the frequency of revolution of an electron in the magnetic field H; the frequency depends on the electron’s effective mass m*, which is related to the dispersion relation for the electrons. The above experiments are carried out at low temperature on single-crystal ultrapure specimens and make possible the investigation of the electron energy spectrum. where L = π2k2/3e2 is the Lorentz number. The deviations from the Wiedemann-Franz law observed when T ≲ θ reflect the characteristics of the interaction of conduction electrons with phonons (when T < θ, lp does not equal the mean free path that appears in the expression for κ and allows for the change in the electron energy flux owing to collisions). Thermoelectric phenomena, such as the thermoelectomotive force and the Peltier effect, also are a consequence of the involvement of electrons in heat transfer. A magnetic field alters the electrical and thermal conductivity and is responsible for such galvanomagnetic and thermomagnetic phenomena as the Hall effect and the Nernst effect. The coefficient of reflection of electromagnetic waves by a metal is close to unity. Because of the skin effect, an electromagnetic wave penetrates only a very small distance into a metal. Theδdepth δ of penetration in the radio-frequency region is , where ω is the frequency of the wave. In the optical region, δ = c/ω0 ≈ 10–5 cm, where c is the speed of light and ω0 ≈ 1015 sec–1 is the plasma, or Langmuir, frequency of the electrons in the metal (ħω0 is the energy of a plasmon). At low temperatures, the interaction of a metal with an electromagnetic wave has features associated with the anomalous character of the skin effect; here, δ ≲ l (seeMETAL OPTICS). The nature of the propagation of electromagnetic waves in a metal is affected by a magnetic field H: when H ≠ 0, slowly decaying electromagnetic waves, called magnetoplasma waves, may propagate in some metals at low temperatures (seePLASMA, SOLID-STATE). SUPERCONDUCTIVITY. In many metals and alloys cooled below a certain temperature Tc, complete loss of electrical resistance is observed—that is, the metal undergoes a transition to the superconductive state. Such a phase transition is a second-order transition if H = 0 and a first-order transition if H ≠ 0. Tc depends on H. In sufficiently strong magnetic fields—that is, when H > Hcr(T)—the superconductive state does not exist. Superconductors have anomalous magnetic properties, on the basis of which two classes of superconductors are distinguished: type I and type II. When H < Hcr the Meissner effect is observed in the interior of a type I superconductor: the strength of the magnetic field there is zero. A type II superconductor can be penetrated by a magnetic field in the form of a complex vortex structure. The phenomenon of superconductivity can be explained by an attraction between electrons owing to the exchange of phonons. Pairs of electrons called Cooper pairs are thus formed, and a “condensate” arises that is able to move without resistance. The stability of the superconductive state is ensured by the presence of the binding energy of the electrons in the pair. As a result, the band of energies of elementary excitations is separated from the energy of the ground state by an energy gap (seeSUPERCONDUCTIVITY and SUPERCONDUCTOR). Type II superconductors are used as windings for sources of strong magnetic fields, that is, for superconducting solenoids. Such solenoids are important for the development of generators, vehicles based on magnetic levitation, and lossless power transmission lines. The discovery or synthesis of superconductors with a high critical temperature and trie introduction of such superconductors in technology may have consequences as momentous as those resulting from the introduction of steam and electricity. SEMICONDUCTORS. In semiconductors, when T > 0, some of the electrons in the valence band and impurity levels undergo a transition to an excited state: electrons appear in the conduction band, and holes appear in the valence band. As a result, a semiconductor at room temperature has appreciable electrical conductivity (Figure 5). The main parameter determining the number of electrons and holes in a semiconductor under thermal excitation is the width of the forbidden band. This width is the minimum distance Δℰ between the valence band and the conduction band. In Ge, for example, Δℰ = 0.746 electron volts (eV); in Si, Δℰ = 1.165 eV. The excitation of a semiconductor can also be produced by, for example, illumination. On absorption of light quanta, electrons move to the conduction band and thereby free positions in the valence band. A characteristic of semiconductors is that their properties readily change under the action of even comparatively weak external effects. Changes in properties may result, for example, from a change in temperature, pressure or illumination or from the introduction of impurities. Numerous applications of semiconductors are based on this fact (seeSEMICONDUCTOR DEVICE). Many properties of semiconductors are associated with electrons and holes having energies close to the bottom of the conduction band and the top of the valence band. Dispersion relations for electrons and holes have been determined for a large number of semiconductors. the number ni, and the mobility ui of charge carriers (electrons and holes): σ = Δni,e2ui. The exponential temperature dependence of σ is a consequence of the exponential dependence on T of the number of carriers ni. Measurements of conductivity, the Hall constant, and thermoelectric and thermomagnetic characteristics have made it possible to ascertain the temperature dependence of the quantities ni and ui and to understand the principal mechanisms by which electrons and holes are slowed down. In some semiconductors, such as Te, that are doped with a large number of impurities, the gas of charge carriers becomes degenerate at low temperatures. This circumstance makes the semiconductors similar to metals: the number of carriers ceases to be temperature-dependent, and such phenomena as the Shubnikov-de Haas effect and de Haas-Van Alphen effect are observed. Superconductivity has been detected in a number of semiconductors. Being attracted to each other, an electron and a hole are capable of forming a system, called the Mott-Wannier exciton, that is similar to positronium. Such an exciton reveals its presence through a series of hydrogen-like absorption lines in the optical spectrum that correspond to energy levels lying in the forbidden band of the semiconductor. A large number of effects characteristic of a plasma have been detected in semiconductors (seePLASMA, SOLID-STATE). A strong magnetic field alters the properties of semiconductors at low temperatures. The region of quantum effects µH ≫ ℰ, where ℰ is the average electron or hole energy, is much more accessible here than in metals, since in semiconductors ℰ ≈ kT and in metals ℰ ≈ ℰF. AMORPHOUS SOLIDS. The electronic properties of amorphous solids depend on whether the Fermi level is located in an allowed or a quasi-forbidden region. The existence of a band structure in amorphous solids explains their division into metals, dielectrics, and semiconductors. Amorphous semiconductors, such as chalcogenide glasses, have been studied in the greatest detail. The existence of a quasi-forbidden band is detected by optical investigations, in which the filling of the forbidden band by quasi-localized levels is confirmed by the presence of absorption tails. A characteristic feature of amorphous semiconductors is the hopping mechanism of electrical conduction. This mechanism accounts for Mott’s formula, which states that the carrier mobility u is exponentially dependent on temperature when the probability of thermal excitation is low—that is, when the temperature is low. 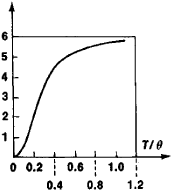 The relation between mobility and temperature under such conditions is u ~ exp [–(T0/T)1/4], where T0 ~ 106° – 108°K. In the hopping process, an electron “selects” a place to which to jump so that the maximum probability of a transition from one state to another is achieved. DIELECTRICS. Crystals that have only filled and empty electron energy bands behave as insulators in an electric field. The first excited level is located at a finite distance from the ground level. The width Δℰ of the forbidden band is of the order of a few eV. The delocalization of electrons in such solids does not play a role even in the description of electronic properties. Dielectrics may be regarded as consisting of spatially separated atoms, molecules, or ions. An electric field ℰ, by displacing charges, polarizes dielectrics. Polarization can be characterized by the electric dipole moment per unit volume P, by the electric induction D = E + 4πP, or by the electric susceptibility a, which relates the polarization P to the external electric field E (P = αE). Hence, ∊ = 1 + 4πα, where ∊ is the dielectric constant. No substances exist in nature for which the polarization P is opposite in direction to the field E and for which α < 0. In other words, electrical analogues of diamagnetic substances do not exist. Therefore, it always is the case that ∊ > 1. In ordinary dielectrics, a dipole moment appears only under an external electric field. Here, ∊ is close to unity and is weakly temperature-dependent. In some dielectrics, the particles have permanent dipole moments; the particles are oriented by an electric field, and we thus speak of orientation polarization. In this case, at high temperatures ∊ ~ 1/T. At low temperatures, the dipole moments are spontaneously oriented and the substance undergoes a transition to the pyroelectric state (seePYROELECTRICS). The appearance of spontaneous polarization is accompanied by a change in crystal symmetry and by reordering of the crystal structure (or is caused by such reordering) and is a phase transition. If the transition is of the second order, it is a transition to the ferroelectric state. The dielectric constant ∊ has a maximum at the ferroelectric transition point (seeFERROELECTRIC). A special class of dielectrics is formed by crystals in which the application of a mechanical stress generates a polarization proportional to the stress. Such dielectrics are called piezoelectric crystals. Only crystals that do not have a center of symmetry can be piezoelectric (seePIEZOELECTRICITY). The dielectric constant varies with the frequency to of an external electric field. This dependence (dispersion) is reflected in the dependence of the phase and group velocities of the propagation of light in the dielectric on the frequency ω. The interaction of a variable electric field with a solid is accompanied by the conversion of energy of the field into heat and is described by the imaginary part of ∊. The electric energy converted into heat is known as the dielectric loss. The frequency and temperature dependences of ∊ are consequences of dissipative and relaxation processes in the solid. The absorption of light by a dielectric can be interpreted as the electronic excitation of a structural particle of the crystal by a photon. The excited state, however, is not localized at specific atoms or molecules but, because of the resonance interaction of neighboring particles, moves through the crystal. As a result, the energy level broadens into a band. Such an excitation is called a Frenkel exciton. Magnetic properties. At sufficiently high temperatures, solids are either diamagnetic or paramagnetic (seeDIAMAGNETISM and PARAMAGNETISM). In the first case, the magnetization induced by an external applied magnetic field opposes the applied field and arises as a result of the common precession of the electrons of the solid with angular frequency ωL = eH/2mc (seeLARMOR PRECESSION). The diamagnetic susceptibility ϰ is proportional to the mean square of the distance of the electrons from the nucleus and therefore can be used to provide information on the structure of the solid. The conduction electrons of metals and semiconductors are delocalized. Because, however, of the quantization of their motion in the plane perpendicular to the magnetic field, the conduction electrons make a contribution to ϰ. In metals, this contribution is of the same order as the ϰ of the ion core. This diamagnetism of free electrons is known as Landau diamagnetism. Diamagnetism is a general property of atoms and molecules and is weakly dependent on the state of aggregation of the substance and on temperature. Diamagnetism is observed only when it is not overshadowed by paramagnetism. Paramagnetism is a consequence of the orientation, by a magnetic field, of the magnetic moments of atoms and, in a metal or semiconductor, of conduction electrons. At high temperatures, Curie’s law holds: the paramagnetic susceptibility is inversely proportional to the temperature. For typical paramagnetics at 300°K, the susceptibility is about 10–5. Nontransition, or simple, metals are an exception. Their paramagnetic susceptibility is anomalously low (~10–6) and is weakly temperature-dependent. This circumstance is a result of the degeneracy of the conduction electrons. The paramagnetism associated with the conduction electrons is called Pauli paramagnetism. The presence of intrinsic magnetic moments of atoms, ions, and electrons and the associated splitting of electronic energy levels in a magnetic field (seeZEEMAN EFFECT) lead to electron paramagnetic resonance, that is, the resonance absorption of the energy of an alternating magnetic field. The structure of magnetic levels is highly sensitive to comparatively weak interactions, such as the particles’ surroundings. For this reason, paramagnetism and, in particular, electron paramagnetic resonance are very important sources of information on the state of the atomic particles in a solid—for example, information on position in the crystal cell and on chemical bonding. With decreasing temperature, paramagnets that are dielectrics or transition metals undergo transitions to the ferromagnetic, antiferromagnetic, or ferrimagnetic states, which are characterized by the ordered arrangement of the intrinsically magnetic atoms. Nontransition metals, such as Li and Na, generally remain paramagnetic down to T = 0°K. The ordered magnetic state, however, is not necessarily a consequence of the localization of the atomic magnetic moments. Alloys of the ZrZn2 type are examples of ferromagnetic alloys in which ferromagnetism is apparently due entirely to band, or delocalized, electrons. In most cases, transitions from the paramagnetic state to the ferromagnetic or antiferromagnetic state are second-order transitions. The temperature at which the transition to the ferromagnetic state occurs is called the Curie point TC, and the temperature of the transition lo the antiferromagnetic state is called the Néel point TN. When T = TC or T = TN, a discontinuity in heat capacity, an increase in magnetic susceptibility, and other effects are observed. The temperatures TC and TN for different solids may differ markedly. For example, for Fe, TC = 1043°K; for Gd, TC = 289°K; and for FeCl2, TN = 23.5°K. The forces that order magnetic moments when T < TC or T < TN have a quantum origin, although the forces are due to electrostatic Coulomb interactions between atomic electrons (seeEXCHANGE INTERACTION). Relativistic interactions, such as magnetic and spin-orbit interactions, are responsible for the anisotropy of magnetic properties (seeMAGNETIC ANISOTROPY). Near T = 0°K, deviations from magnetic ordering are small and are not localized in specific regions. The deviations propagate through the crystal in the form of waves called spin waves. The corresponding quasiparticles are known as magnons and are manifested in thermal and magnetic properties. Thus, the thermal excitation of spin waves increases the specific heat of magnetic substances (as compared with nonmagnetic substances) and leads to a characteristic temperature dependence of the specific heat. In ferromagnetic dielectrics, for example, C ~ T3/2 when T ≪ θ2/TC. The resonance absorption of electromagnetic or acoustic energy by a magnetic substance—that is, ferromagnetic or ferroacoustic resonance—involves the conversion of a photon or phonon into a magnon. When T ≪ TC, the magnetization of ferromagnetic substances and the magnetic susceptibility of antiferromagnetic substances are dependent on temperature because of the freezing out of spin waves with decreasing temperature. Nuclear phenomena. The role of atomic nuclei in the properties of a solid is not limited to the solid’s mass and positive charge being concentrated in the nuclei. If the nuclei have magnetic moments, the contribution of the nuclei to paramagnetic susceptibility and specific heat becomes appreciable at sufficiently low temperatures. This fact is evidenced particularly clearly in the measurement of the resonance absorption of the energy of an alternating magnetic field. Zeeman splitting of nuclear energy levels is responsible for nuclear magnetic resonance, which is widely used as a method of studying solids, since the structure of nuclear magnetic levels depends to a considerable degree on the properties of the atom’s electron shell. Many nuclear and electronic processes in solids have specific features that permit the processes to be used to study the properties of solids. For example, the study of electron-positron annihilation makes it possible to investigate the properties of the electronic system of a solid. The resonance absorption of gamma quanta by nuclei is a widely used method of investigating, for example, a solid’s energy spectrum and localized magnetic fields (seeMÖSSBAUER EFFECT). The frequency of nuclear magnetic resonance changes upon the transition from the normal to the superconductive state. The investigation of the interaction of fast charged particles with solids has shown that the ordered arrangement of atoms has a considerable effect on energy transfer from a fast particle to atoms of the solid. For example, the mean free path of a fast particle is sharply dependent on the direction with respect to the crystallographic axes (seeCHANNELING OF CHARGED PARTICLES IN CRYSTALS and ). Conclusion. The electrical, magnetic, and optical properties of solids find broad application in such fields as radio engineering, electrical engineering, and instrumentation. Semiconductor devices have supplanted electron tubes. Superconducting solenoids are replacing electromagnets. High-frequency devices and measuring instruments that make use of superconductors are being developed. Crystals are widely employed in lasers. Modern technology makes extensive use of the quantum properties of solids. Experimental methods of investigating solids are expanding in scope and now include low temperatures, strong magnetic and electric fields, high pressures, virtually the entire electromagnetic spectrum from radio waves to hard gamma waves, and various penetrating particles (neutrons and high-energy protons). Some investigations of solids have become possible only with the appearance of ultrapure crystals. An important feature of solid-state physics is the possibility of synthesizing solids with required properties. The use of superconductivity in technology is based on the development of superconducting alloys, such as Nb3Sn, that not only have high transition temperatures and high critical magnetic fields but also exhibit plasticity. Solid-state physics is a continual source of new information. The new physical concepts developed in solid-state physics are being made use of in nuclear physics, astrophysics, particle physics, molecular biology, geology, and other fields. Landau, L. D., and E. M. Lifshits. Mekhanika sploshnykh sred, 2nd ed. (Teoreticheskaia fizika). Moscow, 1953. Landau, L. D., and E. M. Lifshits. Statisticheskaia fizika, 2nd ed. (Teoreticheskaia fizika, vol. 5.) Moscow, 1954. Landau, L. D., and E. M. Lifshits. Elektrodinamika sploshnykh sred (Teoreticheskaia fizika.) Moscow, 1959. A substance that has a definite volume and shape and resists forces that tend to alter its volume or shape. A crystalline material, that is, one in which the constituent atoms are arranged in a three-dimensional lattice, periodic in three independent directions. Processors who are set up for solid color have successfully integrated liquid-color technology by adding portable dosing equipment. The wood fibers used in some types can come from oak or other high tannin species, so there can be a significant discoloration of solid color stains. PHOTO : The LMA's voluntary standard for polyvinyl chloride overlays consists of four basic categories: 2 mil reverse printed rigid film, semirigid film, sandwich film and solid color film. At Bestow Mens Fashion Ltd, they offer the best collection of designer ties in bright and solid colors such as red, brown, blue, green, black, etc. Avloy film finishes can match the full range of high- or low-gloss solid colors, metallics, and pearlescents available with liquid paints. s solid color offering, which ranges from tinted whites to an expanded neutral palette, to rich chromatics and finally deep, "blackened" tones. The solid color stain is available in an unlimited color palette. The Collection bedding showed Calvin Klein's inclination to striped patterns, such as that of Arasta, with stripes of rich yarn-dyed colors, jacquard woven with an overlay of texture and solid color. Pansies with black blotches on their petals are sometimes called ``faces'' because of their large size compared to solid color pansies. With digital printing technology, we can now print an entire run of solid color high-quality lithographic prints in one day. In the Westminster show - held at Madison Square Garden - Mishka competed against cocker spaniels in the ASCOB category - any solid color other than black. The comeback Cannon brand from Pillowtex is launching a range of towels, from the basic solid color to jacquard-woven to fancies at varied price points starting at $4.